Basing on the beautiful, diverse as well as nice looking nature of the vegetation around the Mountains of the Moon, UNESCO deserved an appreciation for naming Mountain Rwenzori National Park a World Heritage Site and to prove this one has to confirm a safari tour to Uganda in order to have maximum memorable experience to view the diverse natural vegetation around the park. The Rwenzori Mountains are really blessed with the wonderful vegetation that visitors planning to have safaris and tours in Uganda should not miss to experience. The interesting diverse vegetation, ranges from tropical rainforest which are characterised by high animal and vegetal biodiversity, evergreen trees, as well as dark and sparse undergrowth interspersed with clearings, scanty litter ,presence of “strangler” creepers presence of “buttresses” and spindly roots in trees living in often-flooded areas. The wonderful vegetation offers visitors with cool nice breath coming from the green trees, favourable place to enjoy the state of solitude while meditating the good melodes of the different bird species living in the tropical vegetation. From the tropic forests the routes take Uganda safari undertakers through alpine meadows natural vegetation which does not contain trees because it’s at high altitude but the Meadows in the park are also interesting because they have very important ecological valve their sunny, open areas favour and attract various floras and fauna that couldn’t grow in other conditions. Therefore your visit to the Rwenzori Mountains offers you an opportunity to see rare species of flora and fauna such as the varieties of giant groundsel as well as giant lobelia and even the heathers which are six metres high and covered with moss that occupy the mountains peak. 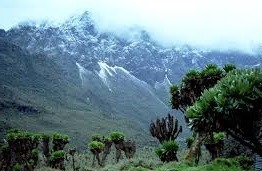 Despite of the fact that most of the flora in the Rwenzori is almost similar to that of other East African mountainous areas, the flora here is much more beautiful, luxuriant and unique to the park only because of the regular and high rainfall pour in the area. The flora here at higher altitude tends to grow larger especially the rare species which are only found in the afro-alpine vegetation zone such as groundsels and lobelia plant species. The wide spread of the vegetation here is much dependant on the favourable altitude and it gives an account of the five vegetation zones in the park for instance for an altitude ranging from 1000- .2000m, the grassland park is covered by grassland vegetation, then from 2000-3000 the park enjoys montane forest, whereas from an altitude of 2500-3000,visitors are guaranteed to enjoy the bamboo vegetation zone , heather vegetation zone (3000–4000m) and finally at an altitude of 4000-4500m, the mountain is full of afro-alpine moorland vegetation zone which can be encountered while on Uganda safaris and tours. The vegetation in the mountains of the moon is totally unique especially at higher elevations and this gives room for travellers on safari in Uganda interested in having quite, lonely life without disturbance from any one but only reward by the good natural view of the beautiful vegetation, being entertained by the bird sounds as well as the roaring voices of wildlife. The reward of taking safari to Uganda particularly to the Mountains of the moon comes from the enjoyment visitors get from the cool temperatures which drop as the altitude increases. During night hours especially on clear skys, the outward radiation has favourable cooling effect.